Leadership Augusta is pleased to host the 2019 Meet The Class event. Join the Leadership Augusta Board of Directors and give a warm welcome to the 2019 Class of Leadership Augusta. This must-attend event will be the first time the members of the Leadership Augusta Class of 2019 will be announced. The evening will include the big reveal – the newest “movers” and “shakers” in the Augusta community, networking with fellow Leadership Augusta alumnus, and light fare plus refreshments. This Leadership Augusta social event is free to attend and is sponsored by Jordan Trotter Commercial Real Estate. For more information and to RSVP, please contact Kate Lecea at Kate.Lecea@AugustaMetroChamber.com. RSVP deadline is Monday, August 13. Leadership Augusta was established in 1980, as an affiliate of the Augusta Metro Chamber of Commerce, to enhance the civic participation of emerging leaders within the region. 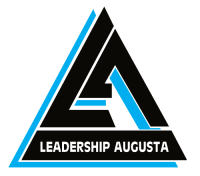 For more information about the Leadership Augusta program, visit LeadershipAugustaGA.com or AugustaMetroChamber.com.